It’s been a long six months since I saw Star Trek, which was my favorite movie of the year. It’s been six months, so it’s tough to compare that with what could be my absolute favorite movie of the year, Zombieland. 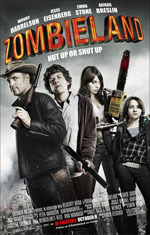 Thinking back on how much I enjoyed both films, Zombieland stands out more. I had more fun with Zombieland. I left the theater smiling after both flicks, sure. But was Zombieland a better movie than Star Trek? I think, in the end, it was. For those of you who haven’t seen Zombieland yet, you’re missing out on a world of pure awesome. There’s absolutely nothing, at all, wrong with Zombieland in the slightest bit. It’s picture perfect in every aspect of the digital world. There’s gore. There’s zombies. There’s a love story. There’s a hysterical cast. There’s an epic tale of trying to survive when every odd is stacked against you. If you enjoy the “comedy horror” genre at all, I absolutely guarantee that you’ll love Zombieland. There’s no doubt about it. And it’s not just the zombies and the story and the script that make the movie so brilliant. It’s the little things, like how the shots are put together. The great use of onscreen graphics when each of the “rules” to survive is talked about by our main character Columbus (Jesse Eisenberg). It’s everything all put together that makes this movie so fantastic. You’re reading this thinking to yourself “you sound like a rambling idiot”, and you’re right, I do. There’s just not enough good things I can say about Zombieland, it’s just that good. Enough ramblin’, go see the movie before it’s too late. You won’t regret it. This is certainly one for the DVD shelf when it comes out on Blu-ray.